An otherwise promising laptop is hampered by a jumpy trackpad, loud fan noise and an unreliable fingerprint reader. Hello, Engadget readers, and welcome to our first laptop review of 2017. The Lenovo Yoga 910 went on sale about two months ago and indeed, we've been working on this one for a while. During the time I've been testing it (with some very lengthy battery tests slowing things down), Engadget has published reviews of new machines from Apple, Microsoft and HP. It makes sense, then, to follow up with a critique of Lenovo's latest, not just because it's such a big name in PCs, but because the company's Yoga 900 series has, until now, ranked among our favorite laptops. The 910 ($1,180 and up), seemed like another shoo-in, with a thin and light design similar to the same Yoga machines we've praised in the past. It also offers some impressive specs for the price (a seventh-generation Core i7 processor comes standard) as well as long battery life that lives up to Lenovo's already-lofty claims. And yet. 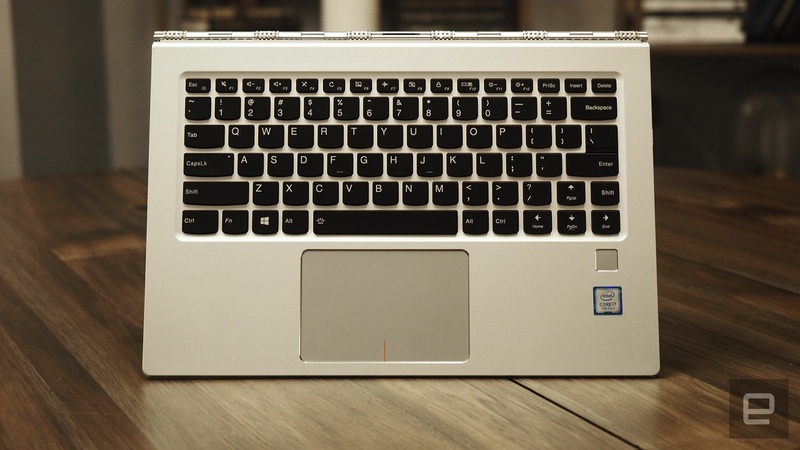 The Yoga 910's jumpy trackpad, unreliable fingerprint reader and loud fan noise can make it frustrating to use, but it's ultimately saved by its compact design, mostly comfortable typing experience and its combination of price and specs. For next year's model, Lenovo would do well to address the longstanding touchpad issues, and replace the fingerprint reader with a Windows Hello webcam. How would you rate the Yoga 910? You'd think that, as a matter of course, each new generation of every laptop would be thinner and lighter than before. In Lenovo's case, though, this is the second year in a row that its Yoga 900 series has been heavier than the one that came before it. All told, the new Yoga 910 weighs in at 3.04 pounds, up from 2.8 pounds. Which is to say, it's still pretty light! 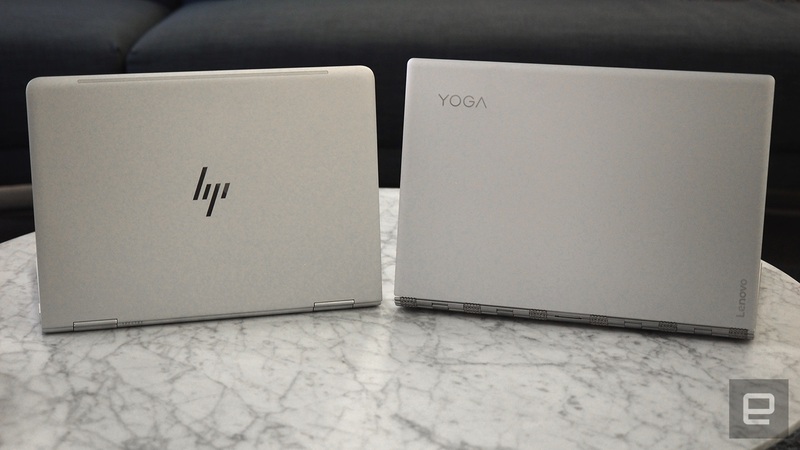 To put those 3 pounds in context, the Yoga 910 is on par with both the 13-inch MacBook Air and MacBook Pro, and just a shade heavier than the new HP Spectre x360. Throughout, the 910 mostly looks like recent Yogas that have come before it, with Lenovo's distinctive "watchband" hinge that takes style cues from watch links. 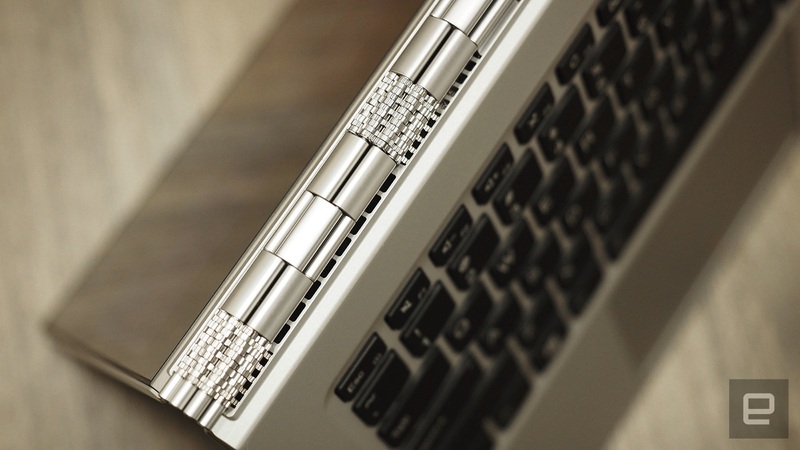 The all-metal design has a slightly soft finish on the keyboard deck, while the chassis has a slight overhang on the edges meant to mimic spines on a hardcover book. The black backlit keys and their slightly odd layout are typically Lenovo as well. The 910's lightness is especially impressive when you consider it has a larger screen than the competition, not to mention last year's Yoga. This year, it rocks a 13.9-inch screen, up from 13.3 on the previous-gen Yoga 900. Like so many other modern flagship laptops, the 910's screen has narrow bezels around the edges, allowing it to fit a more compact chassis than it would otherwise. 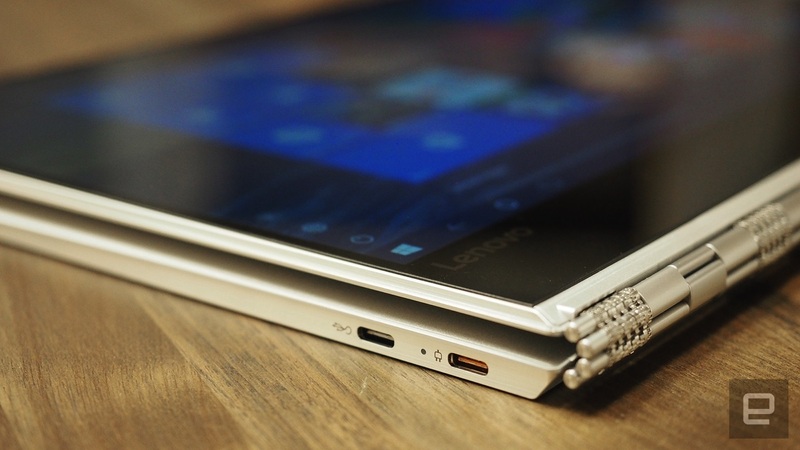 Indeed, the 910 doesn't feel like a nearly 14-inch notebook. The fact that it's slightly thinner than last year's model (0.56 inches versus 0.59) also adds to the illusion that the laptop has a smaller screen than it actually does. That said, the 910 is just long enough that it won't comfortably fit into a standard 13-inch laptop sleeve; you'll want to size up to one designed for 14- or 15-inch systems. Unfortunately, too, another cost of that bigger screen is some blank space at the bottom -- a thick black bar where instead of pixels you'll find the 720p webcam. This isn't the first laptop we've seen with a camera on the lower bezel, so I can say from experience that a setup like this could make for some potentially unflattering angles. Instead of a Windows Hello webcam, you'll find a fingerprint reader at the right end of the palm rest. Unfortunately, the setup process wasn't nearly as seamless as the Windows Hello cameras I've tested -- I fought through repeated error messages saying the sensor couldn't detect my finger. Worse, this fingerprint reader wasn't nearly as reliable. More often than not, I was forced to enter a PIN instead. Fortunately, the keyboard itself is mostly enjoyable to use. The buttons here are well-spaced and offer a surprising amount of travel, especially compared to competing laptops. The Control and Function buttons on the left are undersize, but this only occasionally tripped me up while attempting keyboard shortcuts. Speaking of the Function key, I appreciate that the Function row up top is home to things like brightness and volume controls, all of which you can control without having to hold down the Fn button. Having recently tested the MacBook Pro, which eschews the Function row entirely, I no longer take this for granted. Sadly, the touchpad needs work. It's spacious, which seemed like an auspicious enough start, but alas, even basic stuff like single-finger tracking feels like a chore. As on some other Windows laptops I've tested, the trackpad has a tendency to latch onto stuff it wasn't supposed to, causing me to do things like reorder my pinned browser tabs. In this case, though, when I did want to click and drag objects around on screen, the touchpad didn't always register my left click on my first choice, leaving me no choice but try try again (and maybe again). I'd say a firmware update is definitely in order here. Like so many other new laptops, the 910 offers USB Type-C ports, though Lenovo mercifully left one full-size one to complement the two smaller USB-C sockets. Weirdly, though, the USB-C ports don't work the same way: The one toward the back is a USB 2.0 connection meant for charging only, while the port next to it follows the USB 3.0 standard and is intended for video output. Neither supports Thunderbolt 3. Again, the mix of ports isn't bad, but ideally, those USB-C ports would be interchangeable, as they are on competing machines, like the new MacBook Pro. I hadn't been doing much on the computer. I woke the morning after my birthday with one immediate goal in mind: Like and respond to all the nice Facebook posts people had left on my special day. And I did just that, occasionally stopping to check email and Twitter, but otherwise focused on the task at hand. To my surprise, even that was enough to get the fans spinning, with the noise loud enough for me to hear over my TV. The whirring persisted even after I took a break and walked away from the machine. To their credit, at least, the fans do their stated job: The laptop never got hot on the underside -- unlike some other systems I've tested recently. Speaking of the underbelly, the two JBL speakers deliver serviceable quality (for a laptop) and pretty robust volume; when sitting alone in my apartment, I could get away with keeping the sound set at 30-something out of 100. If all you wanted was to check email, Facebook and Twitter, you could spend half or a third of the price for a Chromebook or budget Windows machine, and possibly get less fan noise, too. But the Yoga 910 is powerful enough for more than just basic use, which I'd assume is a requirement for most people willing to spend $1,180-plus on a new laptop. Indeed, that loud fan noise aside, the 910 is a fast machine. It boots in just seven seconds, and the NVMe-made SSD delivers average max read speeds of 1.59 gigabytes per second, according to the ATTO benchmark, though write speeds came in at a less remarkable 313 MB/s. The model I tested had the same 2.7GHz Core i7-7500U CPU and integrated Intel HD 620 graphics as the other available configurations, though my unit has 8GB of RAM and a full HD screen, whereas higher-end SKUs have 16 gigs of memory and 4K screen resolution. It's worth emphasizing that the 910 packs one of Intel's new seventh-generation Core processors. What's more, the 910 remains one of the few machines to date that actually offers it (many rival systems are still stuck on older sixth-gen CPUs). You can see the edge in our benchmark results, listed above. The 802.11ac wireless radio was mostly reliable, but on one occasion I was the only one in AOL's office not able to connect to the usually-fast network. I had to disconnect the network and then toggle WiFi on and off before getting it to work. In general, too, the machine seemed slightly slower than its peers to reconnect to known networks after waking from sleep. Again, though, once connected, wireless speeds were consistently fast. Weirdly, early on in my testing I got one result in the 19-hour range and another around 17 hours, but neither of these stellar outcomes was reproducible; it was only in the 16-hour range that I ended up seeing consistent results, so it's from that batch of scores that I calculated the official score presented in the above table. That's obviously a big improvement over the nine hours and 36 minutes I logged on last year's Yoga 900. Sixteen-hour runtime is also good enough to best most of its rivals, including the HP Spectre x360 and the new MacBook Pro. The Yoga 910 starts at $1,180 on Lenovo's website, though $1,330 is presented as the original price. This is the configuration we tested, which comes with a Core i7-7500U processor, 8GB of RAM, a 256GB solid-state drive and full HD display. For $1,280 (usually $1,430) you get the same specs, but with a 4K display. Moving on, $1,630 nets you 16GB of memory and a 512GB SSD. Finally, for $1,650 you get the same processor, 16GB of RAM and 4K display, plus a terabyte of storage. HP's recently refreshed 13-inch Spectre x360 is remarkably similar, in everything from price to specs. The machine starts at $1,150 and weighs 2.85 pounds, also with a 360-degree hinge and metal body. It, too, packs Intel's seventh-generation Core processors and up to 16GB of RAM and a terabyte of storage. The battery life is long, though not as quite as epic as the 910's, and there's no 4K screen option. The touchpad is also stubborn, but still better than the one Lenovo used. Also similar to the 910, the x360 can get loud, and it runs warmer, too. Still, I prefer it to the 910, partly because of the touchpad, and because it offers a Windows Hello webcam that performs far more reliably than the fingerprint reader on Lenovo's laptop. You should also check out Microsoft's recently updated Surface Book thanks to its well-built design, 16-hour battery life and comfortable keyboard and trackpad, though the heavier weight (3.68 pounds) and high price ($1,499-plus) might be a turnoff to some. The 2.7-pound Dell XPS 13 ($800-plus) is also a perennial Engadget favorite, thanks to its small footprint, nearly bezel-less display, comfortable keyboard and well-constructed build. Though it's had the same design for nearly two years now, Dell has done a good job updating the internals, with the maxed-out model offering the same seventh-generation Core i7 processor, 16GB of RAM and 1TB of storage as the competition. Problem is, that model will set you back a whopping $2,250, which doesn't seem reasonable given what Lenovo et al. are charging. Meanwhile, Acer has the Spin 7 convertible, which Engadget hasn't reviewed, but I can already spot a few downsides: For $1,250 it has a lower-performance Core Y-series processor, with a relatively low-res full HD display (Lenovo gives you 4K for about the same price). The design isn't as sophisticated, either, though that's, of course, subjective. Lastly, there's Apple, for which I submit the 12-inch MacBook and the new 13-inch MacBook Pro. (The MacBook Air's aging design and specs make me hesitant to recommend it for the kind of person eyeing Lenovo's latest flagship.) Neither machine is a convertible or even touch-enabled, of course, and the 12-incher, in particular, isn't going to match Lenovo in terms of either battery life or performance. But at 2.03 pounds it wins on portability. All told, I don't really see it as a Yoga 910 competitor, except that its $1,299 price puts it in the same ballpark as some of Lenovo's configurations. The new MacBook Pro ($1,299-plus) weighs in at 3 pounds and outmatches the 910 on both graphics potential, audio quality and the touchpad experience. The battery life isn't as long, but it's still respectable, at least if you go for the lower-end MacBook Pro, which eschews the Touch Bar above the keyboard. (The Touch Bar isn't useful enough to justify giving up the convenience of Function buttons, though it's worth noting you only get a Touch ID fingerprint sensor on the Touch Bar edition.) The 910 wins on port selection, if only because there's a full-size USB connection, but that's not enough for Lenovo to secure the higher overall score, especially if the available ports don't even support Thunderbolt 3. All told, my biggest grievance is the touchpad, and that's thankfully (hopefully) something Lenovo can alleviate with a software update. That would still leave some fan noise, a few shrunken keyboard buttons and a lack of Thunderbolt 3 support, but these are more minor concerns. If Lenovo can fix the trackpad and replace that temperamental fingerprint reader with a Windows Hello webcam in next year's model, the 900 series will once again stand among the winners.